MIMObit currently runs on Windows only. Network (i.e. Floating) as well as Node Locked Licenses are available. To buy, contact sales directly. And there have been several other verbal positive comments that cannot be listed here. So, don't wait. Give MIMObit a try! Contact us for a trial license. simultaneity with a certain scientific announcement that same day was unintentional and purely coincidental! MIMObit analyzes networks consisting of Tx and Rx radios enabled with multi-antenna systems in a variety of propagation environments. It provides graphical output of Spectrum Utilization, SINR, Capacity and Bit Rates. It also provides Spectrum Utilization Information such waterfall charts, Occupancy and signal or interference Power Spectral Density in the environment. MIMObit is based on an electromagnetics exact formulation of the network formed by arbitrary distributions of Tx and Rx radios. The radios in the propagation environment are grouped into three groups, signal transmitters, interference transmitters and receivers. All radios could be outfitted with single or multiple antenna systems. The user can customize the excitation vectors of each radio so as to apply various algorithms of choice. MIMObit then calculates signal and interference Power Spectral Density in the environment, Spectrum Occupancy, waterfall graphs, Capacity and Bit Rates for LTE, 802.11n 802.11ac and WiMAX radios. MIMObit also includes a Method of Moments tool to describe various dipole arrays and reflectors. MIMObit also allows the user to import antenna files from simulations via the HFSS and CST's Microwave Studio, FEKO and the XFDTD EM simulation tools. It supports simple and complicated propagation models such as LOS, flat-Earth, iid, SCME, Winner II, Winner+ and IEEE TGn. It also accepts user defined propagation models/files. MIMOscript is the scripted version that could be invoked from within in-house codes for additional research studies and investigations. Full polarimetric Ray Tracing in EM.Terrano (agnostic of the antenna systems used). All MIMO antenna design experimentation, including capacity and throughput sims, performed in MIMObit. Multiple Input Multiple Output (MIMO) antenna systems are being employed in WiFi to increase robustness and throughput and are fundamental to the successful deployment of Cognitive Radio, 4G and 5G wireless systems. But, unlike past practices, MIMO antenna systems cannot be adequately described with traditional attributes of gain and radiation efficiency alone. Furthermore, the same techniques that optimize MIMO systems have the greatest potential in optimizing Spectrum Utilization and Dynamic Spectrum Access (DSA) approaches. Thus, integrated approaches, where antenna design decisions are made at the Capacity/Throughput level, while DSA decisions are made at the Spectrum Utilization Efficiency (SUE) level are required in order to arrive at optimal cost-performance solutions. MIMObit provides just that! For the antenna designer, in addition to the conventional MEG, ECC, etc., performance evaluation of antenna systems in terms of achieved Capacity and Throughput. Based on an electromagnetics exact formulation, MIMObit treats MIMO antenna systems very accurately, including antenna terminations, element coupling, matching circuits, full active E-field gains and various standards based RF propagation models. For the DSA designer and spectrum manager, Signal and Interference Tx radio user-defined power masks and temporal behaviors allow for the evaluation of RF Radio Maps, Harmful Interference, Spectrograms and Spectrum Utilization. · MIMO Antenna Design Evaluation at the Capacity and Throughput level for LTE, WiFi, WiMAX & 5G sytems. Product level EM description of antenna systems. 4x4 MIMO with a 4-port antenna system on the handset (the handset CAD includes some 90 parts in order to capture enough details for design decisions at the product level). Capacity CDF of the link on the left. Capacity vs. average SNR and choice of 4x4 or 4x2 mode. MIMObit includes a versatile 5-stage multi-branch and multi-band matching network design utility. For each band of interest, you can specify the matching network for each antenna port, examine the resultant S-parameters and, after you deem the quality of the match acceptable, save the lumped element values used and the Touchstone 1.0 file description of the network. It can then be combined with the antenna and MIMObit will transform the S-parameters to those of the combined circuit and also transform the active E-field gains of the matched antenna for subsequent system simulations. PlotLab is a utility that allows the examination and a variety of experimentation and studies of MIMO antenna systems. 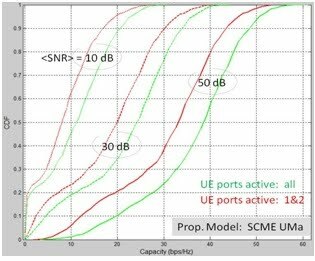 The user can import a multi-port antenna system and examine its S-par behavior and its active E-field gains (vectorial) under any arbitrary excitation condition. Additionally, the user can combine the antenna system with any matching or other network for a brand new antenna system. For example, an original 6-port antenna system could be turned into a 2-port antenna where each port would be drive, via a corporate feed, three of the original antenna elements. The "matching" circuit in this case could consist of two independent 4-port power 1-to-3 dividers/combiners. 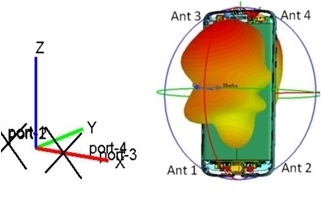 The active E-fields of a MIMO antenna system depend on the source impedances and PlotLab allows the user to change the latter and examine the effect on MEG, ECC, Radiation Efficiency, etc. Additionally, S-par reference impedance renormalization and port extensions are offered. Finally, the active input impedances of the antenna system are dependent on the excitation vector and are dynamically listed. That is, they change upon a user change of the excitation. MIMObit can now import directly from EMAG's Terrano, a fast and full functionality Ray Tracer, propagation scenarios. The user defines a geometry and the location of Tx and Rx radios in Terrano and exports directly into MIMObit the results of the plane wave decomposition simulation (i.e. all the rays connecting the Tx-Rx radio pairs with their polarimetric characteristics such as Angles of Departure (AoD), Angles of Arrival (AoA), loss, delay, phase for both polarizations). The user continues in MIMObit with the ability to study any MIMO antenna system, on any of the radios, under any orientation, of any temporal behavior, etc. All the usual MIMObit Capacity and Throughput results are then available as well as all the experimentation features (including scripting for calling MIMObit from inside the user's own codes and more customized studies). The plot to the right shows the Total Power around a Tx radio installed on a 10m high pole somewhere in Manhattan. The user can run RadMap, PropStats or OrientStats in MIMObit to study peculiar mmWave environments and antenna systems that may not be well represented by the existing 3GPP propagation models. MIMObit results on an imported Ray Tracing propagation environment (somewhere in NY City). This video tutorial shows how the Method of Moment (MoM) code integrated in MIMObit can be used to design simple dipole-like antenna structures. This is a completed RadMap project. It contains all the input files and the results files for a system of 4 Tx radios (1 signal and 3 interference transmitting radios) as well as the output results. These files are stored in a zipped directory which, in order to bypass firewall issues, has its extension changed to .txt. 3) You can visualize the RadMap results and experiment with various changes to the excitation vector/power, etc. You can also edit the Tx, or Rx files and modify the characteristics of the radios involved. This example demonstrates each of the three MIMObit Apps, RadMap, PropStats and OrientStats, on some WiFi antennas. A 4 cross dipole antenn system is used at the Tx. Two Rx antenna designs are considered, a 2V-pol and a 3 V-pol dipole antenna systems. download the RadMap tutorial from here. A tutorial with most of the capabilities of RadMap applied to a 4x2 MIMO scenario. It includes a 4-port signal Tx radio, an Interference Tx radio and a grid of 16x16 Rx radios equipped with 2-port antenna systems. download the PropStats & OrienStats tutorial here. A tutorial with most of the capabilities of PropStats and OrientStats applied to a 4x2 MIMO scenario. It includes a 4-port signal Tx radio, an Interference Tx radio and a single Rx radio equipped with a 2-port antenna system.